Well, it's that time of year again for sharing my Thanksgiving recipes. I'm a bit late this year because things have been a little crazy around here. This will be my 6th low carb, wheat free Thanksgiving. It's hard to believe. It just seems so "normal" now that I don't stress about it or worry about what to make since I've recreated so many of my favorite recipes over these last 6 years. I still make a few things for the family that I don't eat but I really don't mind at all because I have plenty of dishes to choose from. If this is your first wheat free Thanksgiving, you might feel like you will never be able to eat your old favorites again...trust me, you will. 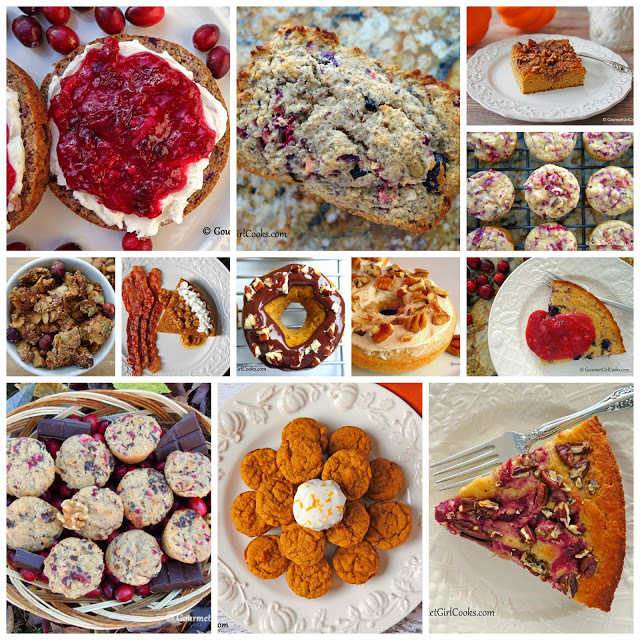 There are so many options and choices available and so many wheat free recipe conversions of your old favorites. I'm sharing some of my favorites that I have made and enjoyed over these past 6 years. 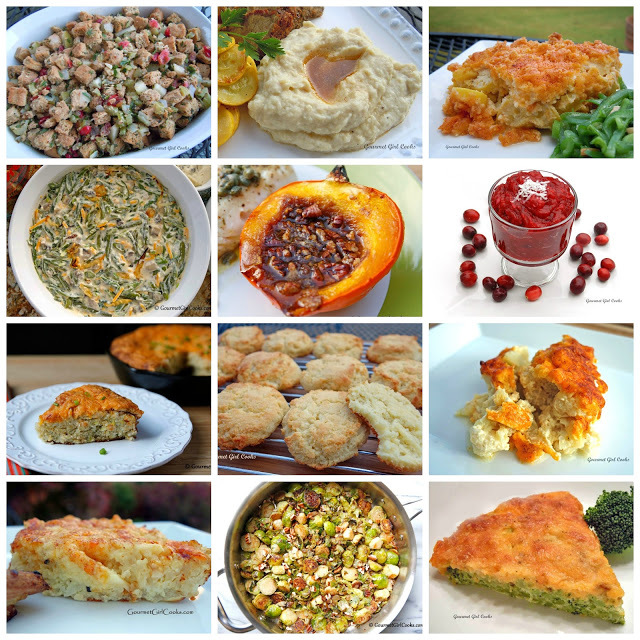 I've attached 3 different collages of recipes below; 12 Thanksgiving Breakfast Ideas, 12 Thanksgiving Side Dish Ideas, and 16 Thanksgiving Dessert Ideas. To get to the page where you can have access to the recipes via links under each individual enlarged photo...simply click on the 3 headings over each collage below. That will take you to the blog page where you can scroll through enlarged photos of each dish with a link in the caption underneath each photo to that particular recipe. Certainly you should be able to find something you'd like to try or something you worried you would never be able to enjoy again. I hope you find some new favorites to put on your Thanksgiving table this year. These recipes also work for Christmas dinner, too. From my table to yours....Enjoy! Thank you for the awesome anthology. 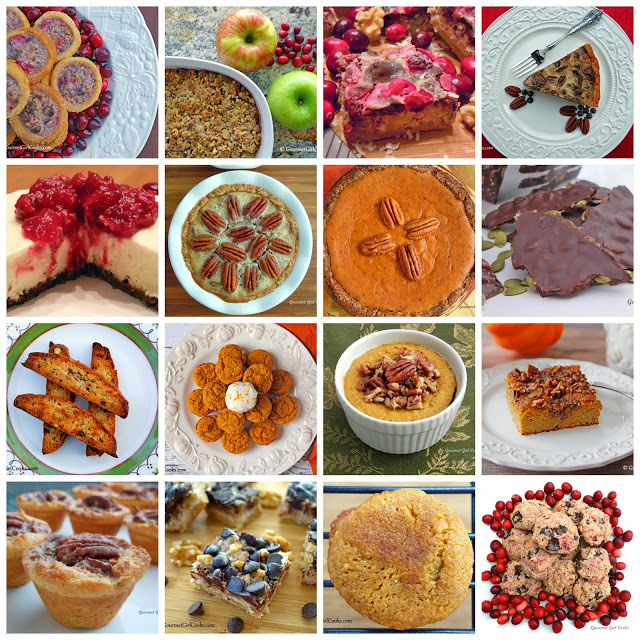 Your stunning photos will surely inspire countless Thanksgiving (& Christmas) cooks, both those who are new to the WB lifestyle as well as those of us who are "old hands" at it. See ... you *can* have a traditional Thanksgiving meal with all of your favorite trimmings. Right now I'm loving feasting my eyes, and pretty soon we'll be feasting our taste buds! :-) A blessed Thanksgiving to you and yours. Thanks so much CyberSis! Hard to believe over 5 years have gone by and it’s the 6th grain free Thanksgiving. No more angst or concern that it will be nothing but blah food! Hi GG, Happy New Year to you and your family ! I hope that you are doing well and that you are warm in Georgia ! Best wishes, Barbara from California. Hi Ayla ! I am wondering how you are ?????? Is every thing alright ? I am worried about you and your family !